We’ve assembled an orchestra of international jewellers and metal smiths to perform our summer symphony at Salts Mill, Saltaire. Laura Baxter, Lincolnshire, framed assemblages of silver birds in their natural environs worn as pendants and brooches. Laura and her creations were very recently featured on BBC1 Countryfile. Lisa Dakin, Holmfirth, delicately enamelled seabirds strut through atmospheric landscapes – decorative plaques for the home. Jordanne Cliffe, London, a jewellery collection of oxidised silver Starling Nests embellished with tiny golden eggs. Angela Knipe, Scarborough, Jim Crow, a chiffon swallow and a leather goose – quirky brooches to make you smile by this renowned textile artist. 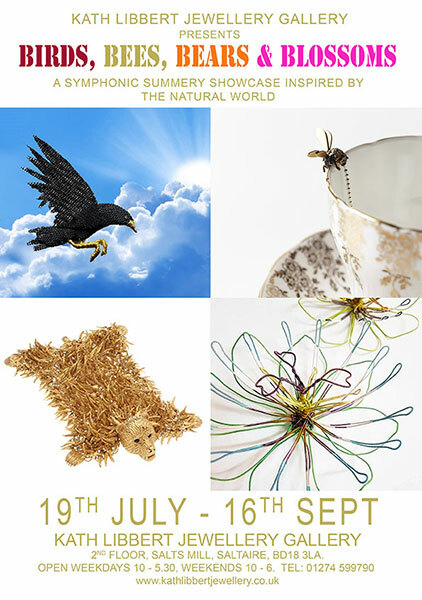 Max Danger, Copenhagen, a prize winning Royal College of Art graduate who finely carves, using modified sewing needles, gorgeous golden bees – Bee Pins on jammy toast, a Honey Drop gold Pinky ring and even a Bee Tea Infuser. All inspired by his research into urban bee keeping highlighting the vital role bees play in our lives. Vicki Ambery-Smith, London, who crafts in gold and silver, detailed interpretations of buildings from all over the world but for this exhibition she presents her AirBee & Bee brooches – a look inside a hive hotel! 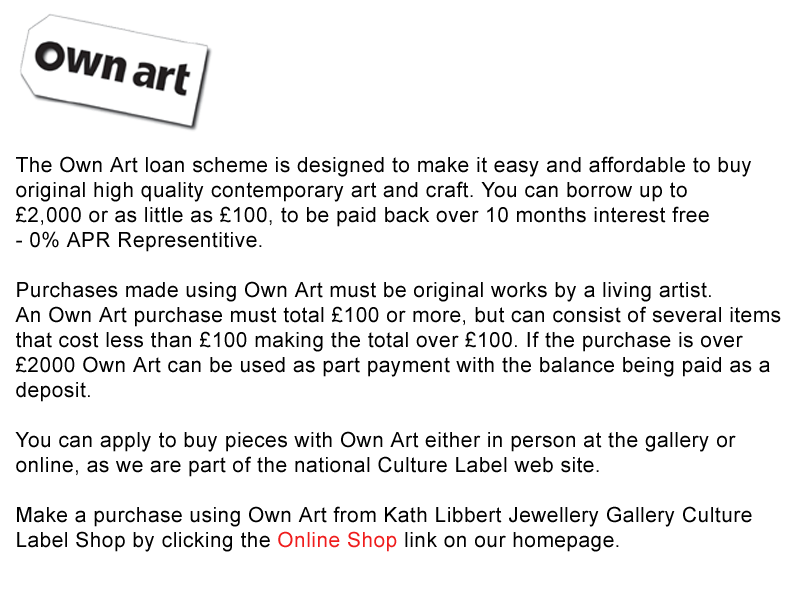 Vicki’s work can be seen in the V&A and the Royal Scottish Museum. Etsuko Kagami, Japan with her delightful delicately embroidered kimono silk bee brooches. Zoe Arnold, London, jeweller and poet who says of her intriguing bee jewels: “I have always found insects fascinating; they lend themselves to jewellery because of their size and delicacy, and yet, there is often something disturbing about them, dark and intriguing. A fragile beauty in contrast with their great contribution. We should all of us, take time to bend and look more closely, or in times to come, we will only have the dark pleasure of seeing them in dusty collections.” Zoe is an award winning jeweller with works shown at Sotheby’s and in the V&A. 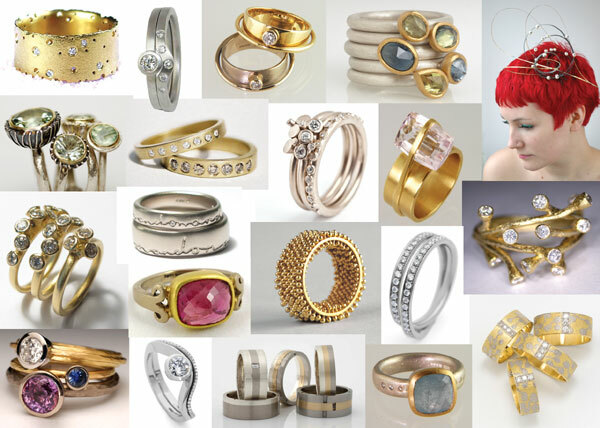 Simon Harrison, London, since the late 1970s Simon has designed and made jewellery for some of the most iconic names in fashion including Jean Muir and for the last twenty years Vivienne Westwood. His exquisite rippling Golden Bear bracelets are inspired by a fusion of the Goldilocks fairy tale and a cheeky nod at the Victorian penchant for bearskin rugs! Hand crafted from delicately flexible chainmail with tiny tufts of metal fur these Bear bracelets feel as good as they look! Lucy Elisabeth, Manchester, fabulous floral Wirework Wallpaper hangings, bouquets of wire flowers, and a Blossom wall piece inspired by David Hockney’s The Arrival of Spring currently on show at Salts Mill. Lauren Bell-Brown, Nottinghamshire, presents ‘Unravelling the Fairy Tale’ a collection of decadent dramatic jewels which portray the beauty in the classic Snow White tale whilst incorporating the Grimm Brothers’ more sinister narrative. 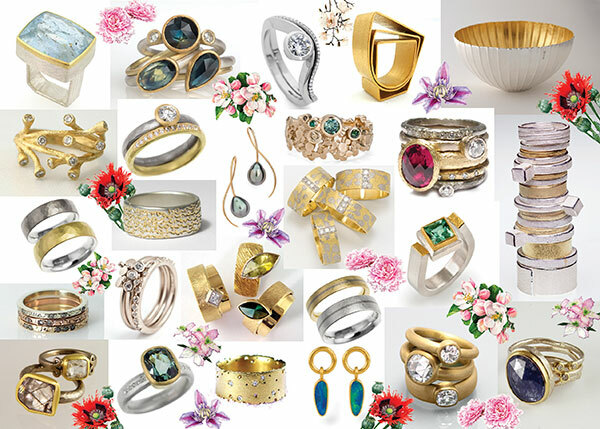 Victoria Walker, Cornwall, brings to life her collection of kinetic blossom jewellery. Her Peony pendant has 34 individually hand pierced petals, and when the stem is pushed up, each duo of petals gently unfolds around a tightly curled centre, replicating the 'never ending' layered nature of Peonies. Handmade in 18ct yellow gold with 9ct rose gold petals, this lovely combination of precious metals reflects the soft pink blush of this beautiful flower. Also adding colourful tones to the Blossom Section are: Iona Hamilton, silver bowls with floral embellishments; Rauni Higson, Sweet Pea fold formed silver jewellery; Ghost & Bonesetter, etched nature sketches on silver bangles and necklaces; Adrienn Pesti, vibrant silk clay bloom earrings and brooches; Sally Grant, mimosa etched silver rings set with wonderful gemstones! 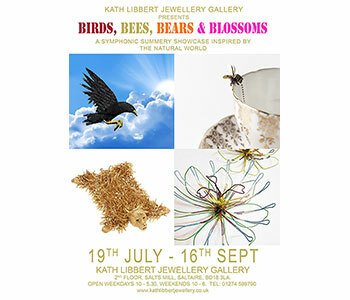 An incredible cacophony of creativity awaits you at Kath Libbert Jewellery Gallery, Salts Mill, this summer – we hope you love it! Let's do it, let's fall in love! Ghost & Bonesetter; Sally Grant; Iona Hamilton; Simon Harrison; Rauni Higson; Etsuko Kagami; Angela Knipe; Xavier Monclus; Adrienn Pesti and Victoria Walker.